Since Father’s Day is just around the corner, we thought we’d share some “My Dad always said” gardening tips with you. 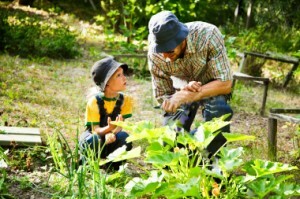 We collected these stories by asking some dads for ONE gardening tip they really want to pass on to their kids. There were some techniques we’ve never heard about before, so we thought we’d share them with you. Now we’re not saying that we’ve tested these tips, but we encourage you to go ahead and try them….and who knows, maybe they’re so good you’ll be passing them on to your kids! A practical and cheap way to increase the iron content for plants that need it more than others is to keep a handful of nails in a tin can full of water, and when they rust, simply empty the water onto the plant and refill the tin can. Of course, there is a less time-consuming solution….we can supply you with trace elements, fertilisers and nutrient rich soils – you know, while you’re waiting for your tin of nails to rust. Dig weeds out of your garden beds by the light of the moon rather than during daylight hours. Not only is it a cool and comfortable time to dig, but the main reason for digging weeds outside of daylight hours is because it is said to discourage the growth of weeds, as the seeds can’t germinate in the dark. One further good reason is that your dad can get all the gardening done in the evenings, keeping the weekends free! Of course, introducing your dad to gardening by moonlight gives you a great reason to buy him some outdoor floodlights or garden lights. Mint can get into your lawn and spread into all sorts of places it’s not wanted, so a tip one dad shared was that, in order to stop his mint plant from escaping, he buried a 50cm long piece of pipe in the ground and then planted his mint in it. He challenges anyone to report mint incursions where they aren’t wanted after using his method. We stock a wide range of drainage and water pipes if you’d like to get your dad to try it….you have to admit it’s more interesting than socks or ties. To obtain a longer vegie growing season, keep your plants warm when nights are chilly. First thing in the morning, place a couple of buckets of water among the plants in your vegie patch, then let the sun warm the water up all day long and it will keep your plants and soil nice and warm long into the night. In the morning, simply tip the water on to the plants and refill the buckets for another day of free warmth. Putting a stick in each bucket will allow bees and other creatures to climb out if they go in there for a drink. Of course, if you have a layer of mulch over your vegie patch, it will also help keep the soil warm and therefore extend the growing season. Now here’s a tip we didn’t expect to hear about, but a committed tomato grower swears that his dad taught him that digging powdered milk in around your tomato plants makes them juicy. We haven’t tried it and would love to hear from you one way or the other. Giving your dad a $20, $50, $100 or $200 gift voucher from BC Sands is a great way to let him choose his own garden mulch, sand, soil or garden mix, or maybe even a new roll-on lawn. Enjoy your father’s company – and if you are a father, we hope you create some happy memories this Father’s Day.